This door alarm sounds instantly when someone touches the door knob (door knob must be metal). Operates on all non-metallic(ie wood or fiberglass) doors with metal knobs. No wiring needed. Alarm produces an ear splitting 120 dB. The alarm sound when someone touches the door knob, but stops when they take their hand off the knob. 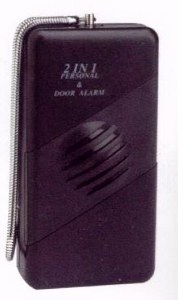 This unit is called a 2 in 1 because it's also a personal emergency alarm. Alarm sounds when pin is pulled from its socket. Wrap strap around wrist with unit in purse or pocket or backpack. Many ways to use. When the alarm sound, it will startle and catch the intruder off guard. They will not know who heard the alarm or has been summoned. It is usually enough to make them back off and find easier targets. Uses 9 volt battery.